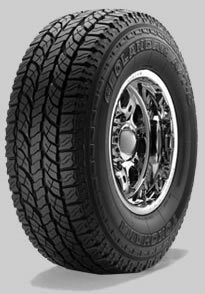 soften the contact between individual tread blocks and the ground to combat uneven tire wear and reduce noise. contributes to long, even wear through the integration of silica molecules. maintain tread block rigidity for improced tire wear, and excellent all-weather traction. increase surface area of the tread to increase traction in dirt or loose gravel while simultaneously reducing tread squirm for enhanced on-road capabilities. mean more stability at highway speeds and enhanced handling with less noise. fight off sidewall cuts and abrasions, and increase off-road bite. create more biting edges, which improve off-road performance. helps reduce pattern noise by varying the size and shape of the tread blocks.